Zachary Black just won't shut up! From the moment he was born he was yakking non-stop. At first his parents are proud of their son but with time they tire of the constant noise. A trip to the doctor and a cure is found. A rhyme and rhythm tongue twister that is a joy to read alou... read full description below. Zachary Black just won't shut up! From the moment he was born he was yakking non-stop. At first his parents are proud of their son but with time they tire of the constant noise. A trip to the doctor and a cure is found. A rhyme and rhythm tongue twister that is a joy to read aloud. 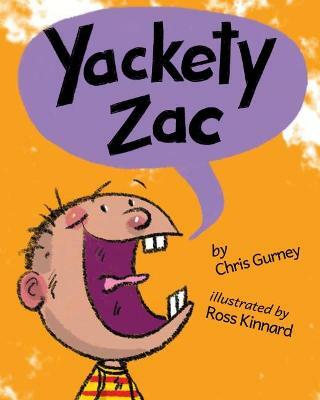 Chris Gurney is author of many picure books for children including the Kiwi Corker series titles Cindy and the Lost Jandal (2009), Little Red and the Cunning Kuri (2010) and Hester's Blister. Her books are known for their rhyme and humour. Ross Kinnaird has illustrated many loved New Zealand children's books including Why do Dogs Sniff Bottoms? which won the Children's Choice award at the 2003 New Zealand Post Book Awards, I Need a new Bum and The Biggest Number in the Universe.